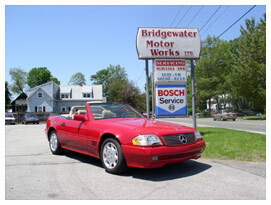 Bob is a third generation mechanic who cut his teeth in the automobile repair business at a very early age helping his dad repair Mercedes in the driveway of his grandparents' house on South Street (in Bridgewater). In addition to having mastered the repair of European automobiles, Bob is a very skilled Toyota technician. He is an ASE Certified Master Technician and has attended factory courses from Toyota, as well from the Robert Bosch Corporation and LMVND. Bob is an accomplished race car fabricator and has won many races as a driver. Several years ago Bob retired his race truck and decided to purchase a house. Today, he is the proud owner of a beautifully restored home. Personally, his life took on a new flavor when he married Nicole in 2010. Life changed once again for Bob in 2011 when baby Bobby was born. Bob is a devoted husband and father and is passionate about his work. Long nights at the shop are not uncommon.